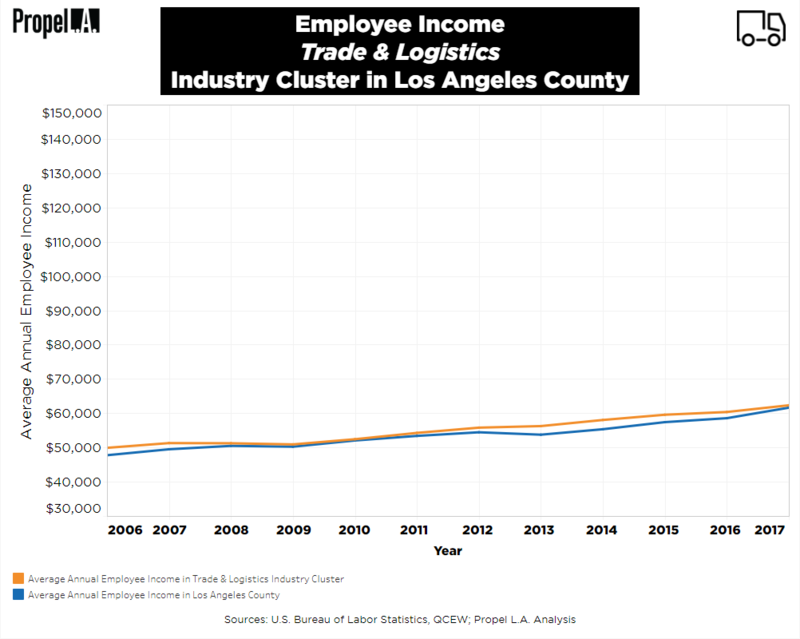 Employee Income of Trade & Logistics Industry Cluster | Propel L.A. In Los Angeles County, the average worker in the Trade and Logistics industry cluster (“Trade”) has historically made the same amount as the average worker in any occupation. In addition, the 2017 wage, $62,292, is more than double the living wage ($28,163) needed for a single individual to cover their basic needs in Los Angeles County. What is the Trade & Logistics industry cluster? The Trade industry cluster is composed of three industries: Wholesale Trade (NAICS 42), Transportation (NAICS 48), and Warehousing and Storage (NAICS 493) (Institute for Applied Economics, LAEDC, March 2016). The cluster provides Los Angeles County with the means to transport goods, facilitating trade across the County and nation. To learn more about the state of the Trade industry cluster, click here. Average annual income was calculated in nominal wage by taking the weighted average of all private wages in the selected NAICS industries. NAICS industries were selected by using the definition of the industry cluster produced by the Cluster Mapping Project (CMP) developed by the Harvard Business School. Annual living wage is determined by the MIT Living Wage Calculator under the assumption that an individual works full-time at 2,080 hours a year.